We’ve had lots of hype about The Witcher 3 lately, and rightly so. It looks like it’s going to be one of the biggest releases of this year, even the big Christmas releases will struggle to topple it. The comparison here isn’t exact, and these two shots most likely wouldn’t make it into one of my graphics comparisons, but you can see where they’re coming from here. There is a definite difference in particles, lighting and just the amount of stuff on screen. The flames in the top image look gorgeous and are some of the most realistic flames I have ever seen. The second image is lacking in that “full” look, as well as lacking the massive amount of particles, but it does look to me as if the fire in the second image isn’t as large a blaze, so there’s that, too. Aesthetic is a very personal thing when it comes to what is “better” or “worse”, but I would personally take a brighter, more colourful game over one that is brown and dreary because “BLOODY SCREEN, SO REAL”. Besides that, though, even taking aside the (in my opinion) better change to a more colourful style, an argument for a downgrade can be made even from these stills and GIFs. In terms of the detailing, lighting, foliage, you can see a definite difference in the graphical quality and detail, and well, if you compare one last set of GIFs to a recent PC ultra settings video, you can see the difference. Without seeing a direct scene to scene comparison, we shouldn’t draw too many conclusions, but pay attention to things like foliage, lighting, shadows, particle effects and the water on all of these. So, it looks at the moment as if there has been a downgrade. How much of one is really hard to say, especially when you take into account that they made a deliberate change of graphics style from realistic to slightly more colourful when developing the game. I think we should all wait for the game to come out before we make a decision on how much CD Projekt have downgraded, but I don’t think any can say that it hasn’t suffered a downgrade of some sort. I’ll let you decide for yourself on the downgrade, but to be honest, even if there has been, a lot of people will mostly be looking forward to the gameplay. 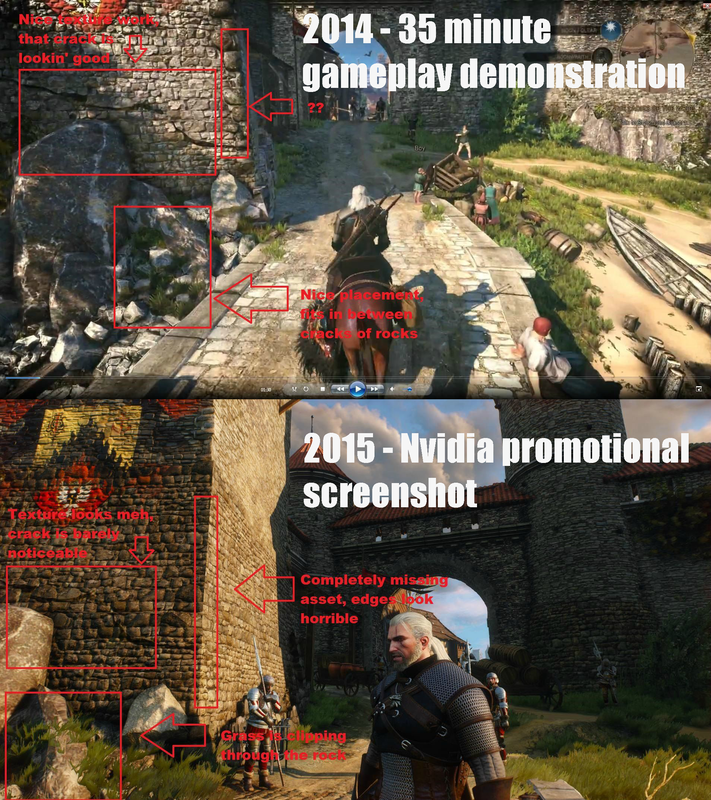 Tagged with cd projekt red, downgrade, graphics, PC, ultra settings, wild hunt, witcher 3, witcher 3 downgrade.